The F4 key reapplies the last action. 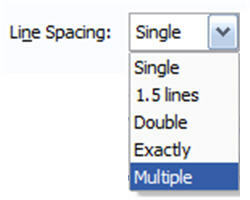 It’s a great timesaver for those repetitive actions – an especially helpful task in customizing the line and paragraph spacing in a text box where not every paragraph gets the same spacing. 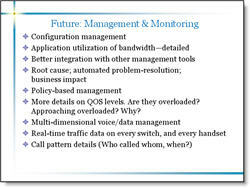 Here is my sample slide with several text boxes and several paragraph spacing opportunities to improve the legibility. 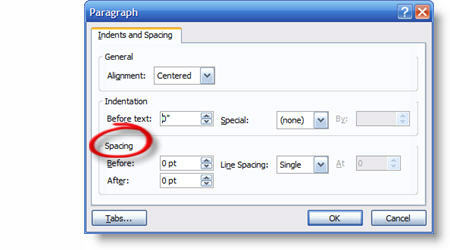 If the formatting goal is to add some additional paragraph space between the bullets on each text box, the process unfortunately involves selecting the bulleted text in one text box, opening the paragraph spacing dialog, adjusting, closing dialog and then repeating the process in the next text box. 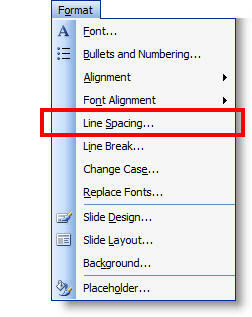 As a shortcut, adjust the Line and Paragraph spacing, then select the next text box and position cursor on the next bullet line. Use F4 to repeat the step automatically! 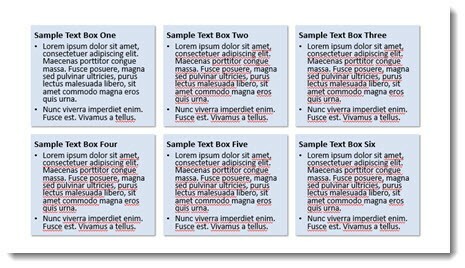 F4 applies the last action made, so in this case you can go from the above sample slide to the one below in less than 30 seconds vs. several minutes selecting text boxes and opening/adjusting the Line and Paragraph dialog 6 times. 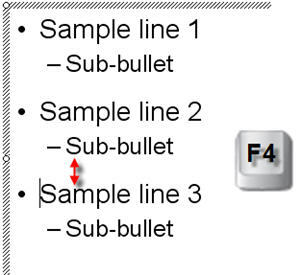 The F4 repeat works on virtually any command while editing slides. 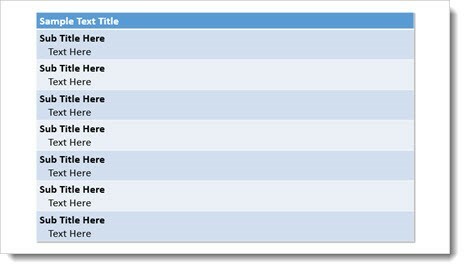 Another great use is formatting text in Tables – in this sample F4 was used to quickly add the text indenting for each 2nd line. Also, Ctrl Y is another key command that does the same thing. So F4 or CTRL+Y repeat the last command. Test it out and see how it can save you time. Here is our sample text. Now to do the same for the third bullet we can either position the cursor on the third bullet line, open the Line Spacing dialog and enter the new distance OR we position the cursor on the third bullet line and click the F4 button! 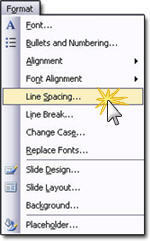 F4 is a keyboard shortcut in PowerPoint that repeats whatever the last action was. 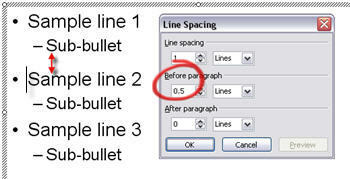 In this case it automatically changes the BEFORE PARAGRAPH line spacing from 0.2 to 0.5, matching the bullet above! 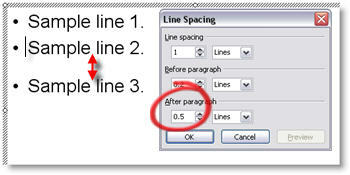 With your cursor positioned at the line to be adjusted, or with the entire text box selected (will globally change all lines in text box), go to FORMAT LINE SPACING. 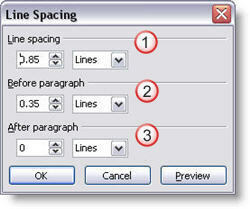 This brings up the Line Spacing Dialog which has three settings that can be adjusted. 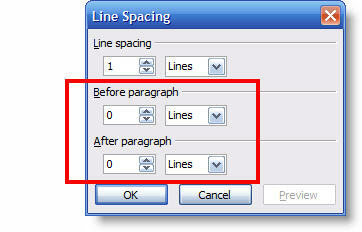 (1) Adjusts the distance between the lines of a paragraph. (2) Adjusts the distance between the start of this paragraph and the one above it (separated by a hard return). (3) Adjusts the distance between the last line of this paragraph and the one below it (separated by a hard return). (1) I adjusted the template so the content text box was separated a bit more from the header text. (3) I adjusted the overall line spacing from 0 to .35, this gives a bit of room between each bullet and allows the brain to “clump” the content into sections – which makes it more legible. 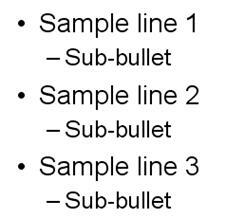 (4) Used a soft return (SHIFT RETURN) and made sub-content on its own line and reduced its font size. Did the same with the sub-content at the end of the last bullet. 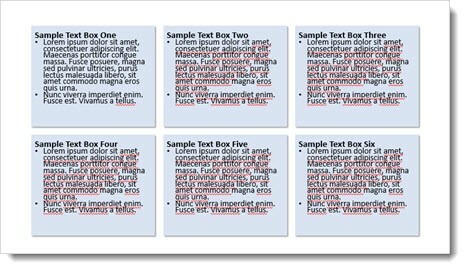 There is a lot of small things that can be done to text heavy slides to make them more legible. 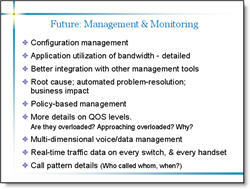 The problem is that this usually involves modifying the content on a slide-by-slide basis, which can be time consuming. But the results are an audience the is able to understand your message clearer!